Cable car fares are charged. Ticket booths are available at both ends of the route. If the booth is closed or when boarding at other stops, pay the fare to the conductor onboard the cable car. Inbound means cable cars going toward Downtown. Outbound means cable cars going toward Aquatic Park. 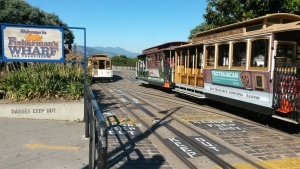 There are cable car turntables at both ends of this route. At Powell and Market, it shares terminal with Powell-Mason Cable Car Line. This page was last edited on 3 December 2018, at 04:19.